Earlier this year, we had an exciting opportunity to pitch for a new project for The Boys’ Brigade. We were asked to create and develop an online shop with full e-Commerce facilities, automated stock control and invoice management. The system needed to be able to manage over 5,000 orders a year and include an online tracking system for all deliveries made across the UK and Republic of Ireland. We were also asked to provide storage for a range of 500 products and provide a complete Pick and Pack service. Our recent move to our new premises and warehousing facilities enabled us to offer a complete end-to-end solution to the client. We won the contract and the online shop went live in May. We have implemented a number of innovations including a bar coding system which is used to pick the stock and automate real-time stock level updates in the online shop. This system negates the need for time consuming manual stock takes and provides automated alerts when stocks are running low and need to be re-ordered. We are continually working with The Boys’ Brigade to upgrade and improve the customer experience. The next stage will be to introduce a print on demand service, enabling site users to create personalised publicity materials. On the 25th May this year, the much-anticipated General Data Protection Regulation (GDPR) will become law. Designed to protect our personal data and to give consumers more control over how their data is used, the new legislation also provides organisations with a clearer legal framework for how they collect and process data. Since the Data Protection Act was created way back in 1998, we now live (and communicate) in a very different world. Technology has given us so many more ways to interact with organisations and companies, but has also created opportunities for our personal data to be exploited. Data processing and security is obviously a key part of our business here at Halcyon, so we’ve been keeping a close eye on the GDPR since it was first announced. Whilst we appreciate it’s been keeping some marketing and fundraising folk awake at night, we believe the GDPR is a positive thing for consumers and organisations alike. By putting consumers first, the ultimate result will be better quality marketing data that is both usable and effective. There is still time to prepare for the GDPR! 2. Decide which of the 6 defined categories for lawful processing apply to each of your data processing activities. The ICO recently published long awaited detailed guidance on Legitimate Interest (one of the 6 defined categories for lawful processing). For many direct marketing activities this basis may be the most suitable. 3. Make sure you have a Data Processing Contract in place with all suppliers who manage or process data on your behalf. The contract should define how data is transferred, processed and kept secure and confidential by both your organisation (the ‘Data Controller’) and your supplier (the ‘Data Processor’). Over the past year, we’ve been providing consultancy and advice to our clients both here in the UK and overseas in respect of their data usage in UK marketing and fundraising campaigns. We are happy to answer your questions on GDPR and help you to ensure your data is GDPR compliant and secure. It’s easy to forget about the paper. Think about that last print run you did. Did you pay much attention to the paper you chose? Did you consider its environmental credentials? Or how it might affect your corporate identity? Customers increasingly want to know about the traceability of products, so making an environmental choice is as important as ever. And how consistently paper is used across your communications also affects how your customer feels about your brand. Do you always print the same things, on the same paper? Are your customers getting a consistent experience whenever they receive something from you? Paper has a huge role to play in keeping your corporate identity on track. Trees that are harvested are replaced or allowed to regenerate naturally. Parts of the forest are protected entirely, in order to protect rare animals and plants. Rights of indigenous people are protected. If they have sacred sites in the forest these are exempt from felling. Local workers must be used to run the forest, and given training, safety equipment and a decent salary. All the wood is tracked from the forest to the store. If you use new paper, then why not tell your customers about its environmental credentials. Add a section to your website using the points above, or link them to the official FSC website here. You can also print the FSC logo on any items you print. Just ask us on your next job and we’ll supply you with the logo and the correct wording to use. And if you’re planning your next mailing, choose FSC envelopes rather than poly bags and you’ll save on your postage costs! Thanks to advances in technology, recycled paper is more efficiently and environmentally produced than ever – in fact, paper can be de-inked, re-pulped and remade up to 8 times! One of the recycled paper ranges that we use is called ‘Revive’ and is available as a 50%, 75% and 100% recycled. And any new paper mixed into the 50% and 75% grades is also FSC certified. Some of our clients use recycled paper on everything they print. If you’d like to know more about how you can use more recycled paper, get in touch using the contact details below. Paper is known as “Carbon Balanced” when any carbon emissions associated with the production of the paper have been offset, along with land saved for bio diversity, by the World Land Trust. The paper comes with a logo that you can add to your printed items and a World Land Trust certificate. All our Revive recycled papers are already carbon balanced, but you can request that any new FSC paper be carbon balanced too. We would love to chat to you more about your paper options, as well as how you can bring greater paper consistency into your business. Simply give us a call. It’s always nice to be known. So let us introduce you to the idea of personalised print. Basically think Moonpig. But better! At Halcyon HQ, we’ve developed a clever bit of software that takes customer orders for personalised printed items, however, our software is completely integrated into your website, fully branded and tailored to your company’s needs. Not sure what we’re on about? Let’s use greetings cards as an example of how it works. Your business would design a range of bespoke cards (or we can do that for you!) with specific sections to be personalised by your customer. The card designs are uploaded to the software for your customers to choose from, and personalise, adding their own message(s), or photo. The customer then enters the recipient’s name and address, and pays for the card. 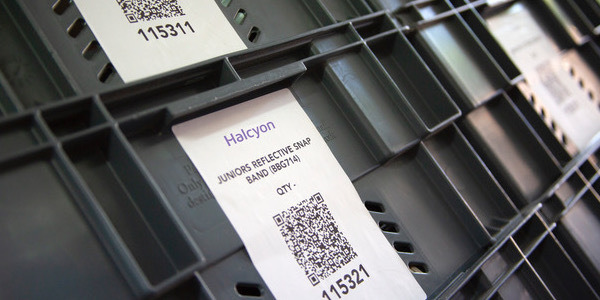 Halcyon receives the order on your behalf, gets the card printed, inserted into an envelope, and dispatched directly to the recipient. Voila! BUT it doesn’t have to be just cards. You can use it for any promotional item that you want your customer to be able to personalise. For example, perhaps you’re arranging a tour that you want regional contacts to promote. They can choose a generic poster design, update it with specific venue or contact information, specify the quantity to be printed, and nominate the delivery address. The software can be completely tailored to your specific requirements, and if necessary, an approval process can be added to enable your sign off. The great thing about using this approach is that it reduces the need for large print runs or storing lots of printed stock. We can also build in CRM integration. Chasing Zero, a Pregnancy Twinning charity, are already using this technology to raise funds through personalised greetings cards. Ask Halcyon how your business can start benefitting from this software. Make sure your latest message reaches your customers before Christmas by taking note of this year’s posting dates. The Halcyon team are available across the Christmas season to make sure your project stays on track. Ask Halcyon about how to reach your customer in time for Christmas this year. The latest stats from Royal Mail are really encouraging. More than 92% of direct mail was opened in the UK last year, up by 10% in just two years! And 48% of adults took action after receiving it. Research from the DMA also shows that direct mail has a response rate 30 times that of email. When direct mail is used alongside other marketing channels, the results get better. According to BrandScience, digital campaigns pay back 62% more when there is direct mail in the mix. On average, direct mail pushes up ROI for every £1 spent from £2.81 to £3.40. People only have one letterbox. And when something pops through it, research shows that customers feel valued. The customers of 58 of the top 60 direct mailing companies, including BT, Lloyds TSB and Virgin, would prefer to be contacted by mail than e-mail. (Source: Ebiquity 2011). It’s well known that using real stamps has positive effects on response rates for direct mail. So we’re eager to tell you that you can improve your response rates this autumn with Royal Mail’s new digital stamps. The trial process, available only until 30 November so you’ll need to be quick, allows a stamp image to be digitally printed on your mail pack…at no extra cost. Talk to Halcyon about your next direct mail campaign today. Print is getting interactive with the help of new scannable technology (think QR codes, but way better). There are loads of mobile apps out there, but why should you use one? And which one is the best? Right now, Intelligent Print Recognition, or iPR, is our top pick. It turns any printed material digital and interactive (even if it was printed years ago) by linking it to mobile marketing campaigns via your brand’s existing mobile app. Simply update your brand’s app with the iPR software, and your app is scanning ready, with no extra apps for your customer to download. Hoorah! iPR software also collects and analyses customer data whenever a printed item is scanned. Finally, you can measure the ROI of a piece of print! Magazines & Mail order – your customer sees a dress they like, they scan the image and voila, they are on your website! Supermarkets – your customer scans a food item and lands on a super tasty recipe using it. Product Instructions – your customer scans a piece of flat pack furniture, and it leads you to a step-by-step assembly video. Bye bye instructions sheets! Ask Halcyon about how to incorporate iPR into your next direct mail campaign today.